At times you might want to resize / reduce size of many photos at once say while uploading multiple pictures on facebook, or when you have to send many photos via one e-mail. You can use photoshop to do the batch resize but it is a lengthy and cumbersome process. Instead, you can try the Image Resize Powertool! 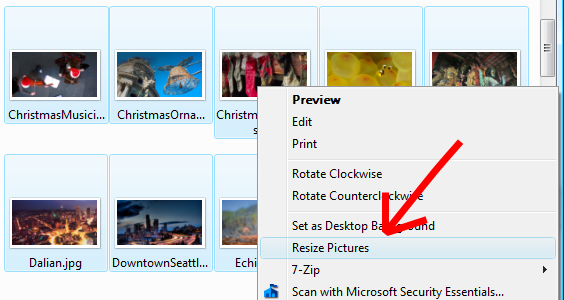 Although you can use the record macro feature to do the multiple image resize on Photoshop but using the Image Resize Powertool will save you a lot of time as it integrates directly within the context menu - it is as simple as selecting multiple pictures and then hitting resize. The Image Resizer Powertoy can be downloaded and installed either from the official website or this direct link. To use this tool all you need to do is select the set of images that you want to resize at once, and right click on one of them, you will see an option called "Resize" on the menu that shows up, just click on it and you will be presented with an advanced options box that has options for setting image dimensions. You can see this screenshot below. As you can see there are 5 different size options for the images that you can resize to, for instance take a look at the 320px by 480px size, it is perfect for going on in mobile devices. Nowadays most of the image sharing happens on mobile phones so you might want to resize images for mobile phone using this size. Other size options are Small, medium, Large and a custom. We recommend not to use the custom size unless you are totally sure of the dimensions of the resized image else you will end up getting an photo that is not in its right proportions. 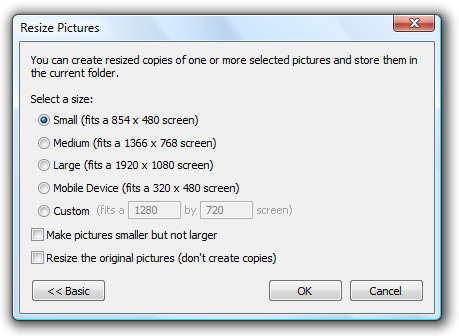 If you do not want to retain the original images during the resize (rather then manually deleting them later) simply choose the Resize the original pictures (don't create copies) option. And the other useful option is Make pictures smaller but not larger - this helps you keep a check on preventing the resizing of images that look bad or out of proportions. Shrunked is also a good upload-on-web specific tool which you can take a look at (Available as Firefox extension).